At , we are dedicated to offering a unique mix of pan Asian cuisine including Japanese, Chinese and deliciously grilled items all served with a beautiful presentation. we offer a variety of traditional dishes prepared with fresh, quality ingredients that is familiar to the American palate. with select daily market deliveries, we serve only the freshest, highest grade sushi and sashimi to please even the most discerning patron. we also offer many varieties of imported sake and daily specials that will amaze you. All of us at Rice will like to wish our Rice Family Happy Holidays! 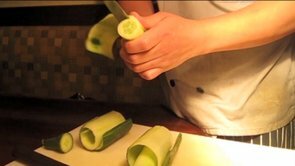 Sushi 101 - Sushi Chef Handy demonstrates how to prepare cucumber slices for sushi rolls at Rice.